Multi Purpose First Aid Kit. 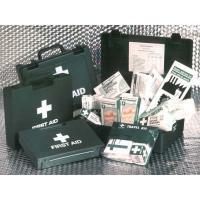 Well organised and comprehensive first aid kit for use in multi varied locations. Light Industry. Medium Sized Offices. Building Yards. Building sites. Travelling. Warehousing. 1 x HS1 Green First Aid Box. 1 x HSE 12x12 Premium Dressing. 1 x Premium No.16 Eye Pad with Bandage. 1 x Triangular Bandage Non Woven. 5 x Cotton Wool Balls. 3 x Low Adherent Pads. 1 x Microporous Tape Hypoallergenic. 1 x Vinyl i/w Pairs Gloves. 20 x Cotton Buds Plastic. 1 x 5.0“ Stainless Steel Plastic Handle Scissors. 1 x 4.0“ Plastic Forceps Green. 6 x Safety Pins Assorted. 1 x A4 First Aid Guidance Leaflet.